With everything on the internet, where people go, look and search for everything, has made content marketing an important part of a marketing industry. It is only after that the term content marketing came into existence and showed up in Google Trends. The general definition of content marketing is a focused content strategy plan, which is marketed and distributed quite well so that it can attract the audience and customers, while it drives to bring more business to the organisation or business. The popularity of content marketing is because of the fact that it is more of a service providing marketing techniques for a customer, i.e. rather than promoting a brand talking about their features, content marketing is solution provider information base for a customer where the reader finds the solution of the problems within a topic. This in return brings customers to the website and also builds the trust on the brand in an indirect way. Therefore, hiring the right content manager is extremely important, hence one need to clear about the brief and reasons for hiring one. Despite the fact that the name has word marketing in it, a content marketing manager is required to be highly creative. Because when creating and developing the content, doing it creatively is important, understanding that what is going on in the market, what is the current required information people are looking for and how that can be beautifully created to attract the customers. Understanding the kind of content that has the possibility to go viral is something does not happen by chance, it is the aspect of creativity that can bring out the best for the business and make customers look for it. While hiring a content manager, it is important to pay attention that they have immense knowledge and skills in their domain. Because they need to understand what is going in the market, which news is trending, it is important to be aware of the various content marketing tools and how to use them. Also, some knowledge about the brand, products and their process is required because these are some of the information which can be shared in an direct way or may become a form to tell stories to the customers. Rather than direct selling, indirect selling works the best for any brand. Because it is not in the face of the customer but provides a subtle approaches to inform them about the brand and their products. For a good content marketing manager, being a good team player is extremely important because their job role requires people to work together. Because they cannot do everything alone, within their team they may require to work along with digital and social media marketing people, they need to get the information from their teammates about everything. During the meetings they need to be open to the ideas of the team, because one never know what best idea may come from someone. They need to experiment with new ideas and suggestions too, as content marketing is not a textbook form of marketing, it requires creativity, knowledge and lot of trial and errors to understand what works and what does not. A content marketing manager needs to have certain level of editing skills, generally as per the size of the organization there will be the teams of editors, yet this is an important asset for a content marketing manager to have. Because they understand the kind of content that will work in the market, hence, their editing skills comes in very handy. They need to have an understanding of the content editing as well as a bit of image editing as the visuals are a popular way of marketing content. Having a good understanding of other basic editing tools be it even videos or graphics will provide an edge to a content marketer to work the best. A content marketing manager need to have an in-depth knowledge and understanding of social and digital marketing and their platforms. Because these are the places where they are required to market the content and every social media platform is different, has different customers and is used in a completely different way. Without having an understanding of them, it will be difficult for a content marketing manager to promote the content to the right market and customers. Having a good understanding provides them an edge where they know what works best and the kind of content that can be created depending upon their target customers. The job of content marketer is not a regular office job, it is something which requires immense passion to be there 24 hours of a day, 7 days of a week and 365 days in an year. Because content is dependent on internet which is functioning continuously, the content on the internet is always moving and reaching to the people without any stop. Therefore, a content marketing manager needs to be aware of the impact their content is creating on the market and keep a watchful eye as to what is happening when, what their competitors are up to. To be able to stay ahead of others is important and requires immense passion and love to do it. A content marketing manager not only requires to have just the knowledge at various things, but also has the capability to do various things at the same time. She or he need to be really good at multi-tasking, should be able to do things on their own too as in when required. They not only need to focus on just the marketing aspect, but sometimes even to create some content, edit it, or is able to do copywriting, have a knowledge of graphics and visuals with the capability to work on various editing tools. As per the requirement, they need to be able to do all of these easily and effectively. Being adaptive is an highly important aspect for a content marketing manager, nothing stays for same in the digital and online industry. We see examples of it everywhere, Facebook as a platform for fun but it has taken shape as a major social media marketing platform, another platform Pinterest was just a way for creative’s to share ideas and knowledge but now has become a major source for people to develop their businesses and share their products to the people for sale. Hence, these examples shows the rapid development that keeps on happening because of this fact that it is essential for a content marketing manager to be able to bring in change within their marketing system and bring out the best possible results in this volatile marketing industry. The content marketing manager need to be a good leader in a team, because they are the one who will provide directions to the team, explaining them how everything needs to be marketed and maintained. They are the ones who understand the strength and weaknesses of their team and assign the task to each of them accordingly. They are the captain of their ship, they require to be proven leaders because they need to take charge of the situations if it becomes difficult to handle. A good leader does not lose out on problems easily and is able to bring the best out of everyone during the times of trouble. Content marketing has task with tight deadlines, sometimes some news maybe trending and it might need to be pushed in between the scheduled work. It is the hectic nature of the job that being a good project manager is important for a content marketing manager to be. They are the ones who need to decide which work is of high priority and which is not, or when something needs to be changed or edited at the last moment. Doing all of this within a tight schedule and then be able to maintain their cool requires a good project management skill. Being organized is an important asset for any content marketing manager, because they are the ones who knows which data is where and how it is suppose to be marketed. They are the ones who are looking into the scheduling and managing content, therefore, the nature of their job demands them to be highly organized. If they miss out on it, they may mess up the information and may overlap the content that was to be marketed. Their job requires the skills to keep everything nicely segregated and managed in a manner where their team can easily be able to communicate and look for the right information without any hassle. Data analysis is an important asset for a content marketing manager because every work done and their results are highly dependent on the analytical part. Therefore, they must know the analytical tools and how to use them well, they need to understand how and which information will work and what can be done next. Because without a good and reasonable analysis nothing can work out well. No matter how much effort you put into something, it needs to be analyzed at some interval of times to be able to achieve better results. Patience is always the key to success, it is what makes or breaks the deals and businesses. Big businesses and success have not happened in a day or in few weeks, but they have taken years to be successful. It is this key feature of patience that is highly essential and required for a content marketing manager to possess. Because a single content article is not going to bring you success or few tweets will not create a following for you. The key is persistence and giving time to it daily, keeping your eyes open and analyzing the content, then as per the analysis taking the right action, which will result in a good number of followers and helps in developing the reach to the maximum audience. All of this to happen requires a lot of patience to achieve success because there will be setbacks too which needs to be overcome with persistence. At the end of the day, every business requires result and revenue, everyone working within the organization is working towards the same goal. Therefore, it is important for the content marketing manager to be highly focused to be able to get to the right and desired results. They need to have a good understanding of the business and what we all are looking into. They need to continuously analyse the data and plan their actions accordingly, with the understanding of the desired results. The interesting fact here is, that not always one need to purely analyse the data and work, sometimes you need to follow your gut feeling and observation to be able to get to the best of the results. With so much of competition in the online marketing segment, every organisation, business be it large or small are hiring and building the team of content marketers. They have now become an integral and essential part of any marketing team where they work towards ideation and promoting the best of the ideas across the various channels. Even for the smaller organisation, content marketing manager has become an important asset, with their strategies these organisations are able to generate more and more business. 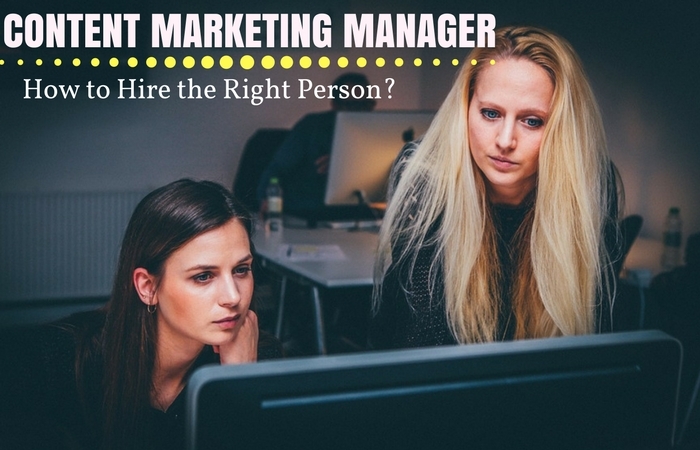 While for many, it may sound an irrelevant deal to build a content marketing team but it is important to understand that the need of the hour is to get a good content marketing manager. It is an investment in the long run. Gone are the days of traditional marketing where companies used to spend lots of money without any major results, while online marketing is a proven and highly effective form of marketing developments.